Hi everyone. Well it's finally here --- yay! :) I'm so happy to have my Christmas Tag Event starting. Over the next twelve days, I'll be sharing one Mixed Media Christmas tag each day that I've made. My tags are small (2 1/8" x 3 5/8"), but they have lots of fun elements. Several of my wonderfully talented and creative friends are joining me for this event. Each of them has a unique and creative style that I'm sure will inspire you (as they have inspired me!). I'll have a new Guest Designer joining me for each of the twelve days. I hope that you'll follow along and be inspired to make some tags of your own. Come play along with our fun Mixed Media Christmas tag event and link up below. The event is open for two weeks, so there's lots of time to play along. I sponged the tag with Antique Linen and Brushed Corduroy distress inks. I overlayed the Starburst stencil and sponged more Brushed Corduroy on top. I inked my Season of Joy (SU!) stamp with Vintage Photo distress ink and stamped at the top of the tag. The flourish is a die-cut (Flourish #6 by Crafty Ann), cut from olive card stock, sponged more olive ink around the edges, and then coated with Granular gel medium. The poinsettia was cut with my Silhouette Cameo from red card stock, and then coated in red glitter glue to give it some sparkle. I added gold liquid pearls and gold stickles to the center of the poinsettia. To finish I used a red stain ribbon. 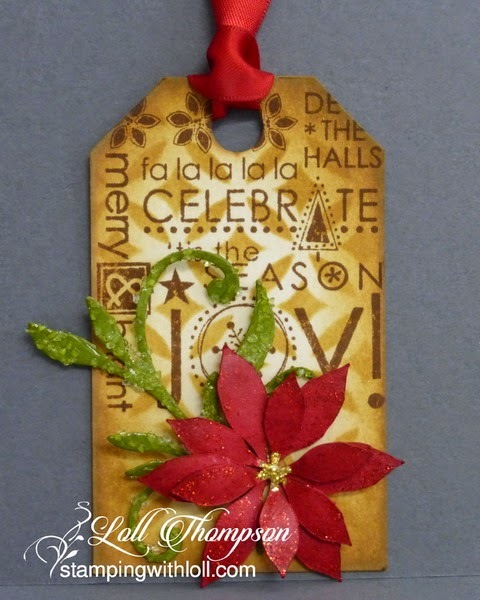 Beautiful tag, Loll, Love your poinsettia and the granules on the leaves look great! Susan's tag is simply adorable! Love the star-y night! OMG. 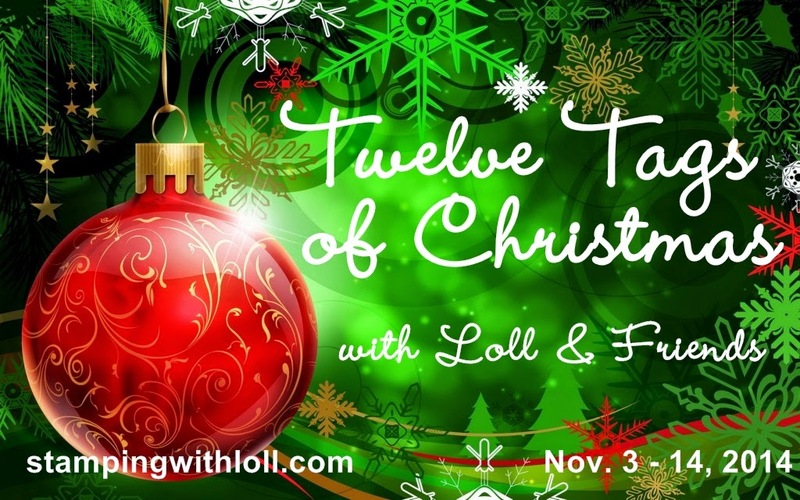 Loll...I am so excited to see your special Twelve Tags of Christmas Event Love after all your time and creativity needed to get your event organized, etc. You must be Thrilled! Your 1st card is amazing with all the gorgeous mixed media elements. I Love Susan's beautiful starry and fun tag too. TFS my friend. P. S. I plan to play later today. What fun! Thanks so much, Loll, for honouring me by asking me to be the Day 1 guest designer!! I had such fun creating my tag and I'm looking forward to making more during your Twelve Days! And looking forward to seeing your other tags and those of your guest designers! can't wait to have time to get started on some tags - looks like lots of inspiration and fun!! Well these are both wonderful tags to start off your event! Loll, love the rich colors and the texture on yours! And Susan, love your starry tag...the blue and gold are gorgeous! Looking forward to each and every day of this fun event! Lol it isi funny we both started today! I love your tag, so much eye candy! Susan's tag is fabulous in the distress ink! Thank you for the invite, I am linking up!! Loll, this event is going to be so much fun! I can't wait to see everyones creations. Your tag is brilliant and I love the addition of the granular gel! I love that season of joy stamp! Susan, your card is so beautiful with that brilliant blue and bright yellow. Love the non-traditional colours! Great start, ladies!! Both are AWESOME tags, Loll! I love vintage feel of your tag, and I love the blue and yellow/gold combo of Susan's tag -- the watermarks and twinkling stars are just super! What a fantastic idea! I love your tags so beautiful! Beautiful Loll, looking forward to the others. These are fabulous, I love the layers on the BG of ur tag and the starry blue of Susan's tag is awesome! Wow what beauties by you and Susan. I love your stencil bg Loll.